DALLAS – A second nurse who cared for Ebola patient Thomas Eric Duncan has been diagnosed with the deadly disease — a day after flying from Ohio to Texas, officials said. But according to multiple news reports, Vinson phoned the CDC before leaving Ohio to report she had an elevated fever of 99.5 degrees and would be flying back to Dallas. Vinson wasn't “told she couldn't fly,” an unidentified CDC source told ABC News. “Somebody dropped the ball,” CBS News quoted one health official as saying. Vinson, who was in Ohio last weekend to plan her wedding, was not experiencing symptoms when she made the flight from Cleveland to Dallas-Fort Worth late Monday, Frieden said. About 24 hours later Vinson, 29, was placed in isolation at Texas Health Presbyterian. Because Vinson’s condition has worsened, federal officials said she will be treated at a biocontainment unit at Emory University Hospital. An air ambulance carried her to Atlanta Wednesday evening. The CDC is asking that all 132 passengers on Monday’s Frontier Airlines flight 1143 from Cleveland to Dallas-Fort Worth call 1-800-CDC-INFO. The flight landed at 8:16 p.m. CT Monday. Since Vinson didn’t have a fever and wasn’t vomiting on the flight, it “suggests to us that the risk to any person around that individual on the plane would have been extremely low,” Frieden said. 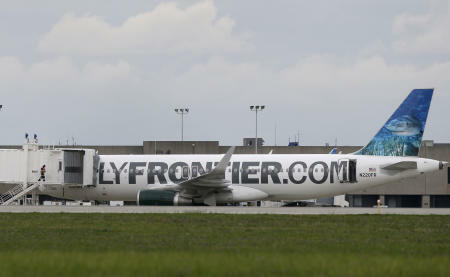 Dallas was Flight 1143's last stop on Monday and Frontier said the aircraft “received a thorough cleaning per our normal procedures.” But Flightaware.com, a flight-monitoring website, told the Los Angeles Times that the Airbus A320 made five additional flights on Tuesday before being taken out of service for decontamination on Wednesday. The White House conceded on Wednesday that there have been “shortcomings” in the response to the Dallas Ebola crisis. “It's not clear what protocols were in place and how those protocols were implemented,” White House spokesman Josh Earnest said during a news conference. Vinson was among 76 hospital workers who cared for Duncan, a Liberian citizen who died from Ebola at Texas Health Presbyterian a week ago. Her colleague, Nina Pham, was diagnosed with the virus on Sunday and is also in isolation at their hospital. Pham, 26, was in good condition on Wednesday, the hospital said. It has not been determined how either nurse was infected, but Frieden said investigators are focusing on the Sept. 28-30 time frame. An ambulance rushed Duncan to the hospital on Sept. 28, and he was placed in “strict isolation.” Two days later, Duncan was officially diagnosed as the first Ebola case in the United States. Vinson and Pham worked those days and had “extensive contact with the patient when he was having substantial amounts of both vomiting and diarrhea,” Frieden said. Federal investigators, Frieden said, have learned that the hospital used various forms of personal protective gear during Duncan’s first days at Texas Health Presbyterian. Medical records provided by Duncan's family show that hospital staffers didn't trade in their gowns and scrubs for hazmat suits until the CDC confirmed his Ebola diagnosis, the Associated Press reported. Throughout the day, local and federal authorities warned that Vinson and Pham may only represent the beginning of the spread of Ebola to the United States. Dallas County Judge Clay Jenkins called the second diagnosis a “gut shot” to the hospital staff and acknowledged that officials were scouting additional hospitals with isolation rooms, should they be needed. “That is a very real possibility,” he said. A hazardous-materials team is now decontaminating Vinson's Dallas apartment in a community not far from the hospital. City officials said she lived alone and had no pets. “This is a heroic person, a person who has dedicated her life to helping others and is a servant leader,” Jenkins said. Vinson, a nurse in Texas for two years, was in Ohio visiting family near Akron. She arrived in Cleveland last Saturday on Frontier Flight 1142, according to the airline. Vinson attended Kent State University and is related to three employees there, Reuters reported. University officials said she did not visit the campus on her recent trip home. “Out of an abundance of caution, we're asking the patient's family members to remain off campus for the next 21 days and self-monitor per CDC protocol,” Dr. Angela DeJulius, Kent State's health services director, said in a statement. In addition to the more than 70 hospital workers being monitored, an additional 48 people who had either direct or indirect contact with Duncan before he was hospitalized are being watched for Ebola symptoms. None have shown signs of the illness so far, officials said. Duncan, who had traveled from West Africa to Dallas days before becoming ill, was the first person to be diagnosed with the virus in the United States. The disease, for which there is no known cure, has killed more than 4,000 people in West Africa in 2014, the World Health Organization estimates.